ORLANDO, Fla. - Feb. 14, 2018 - PRLog -- Best known for the versatile all-in-one PET DINETTE & Leash, SitStayGo™ is excited to showcase their full product line with pet industry professionals at Global Pet Expo. This year's premiere event will be held on March 21-23 at the Orange County Convention Center in Orlando, Florida. 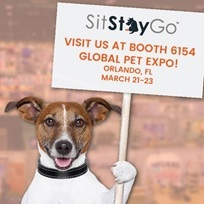 SitGoStay™ welcomes all attendees to stop by booth #6154 to check out the popular PET DINETTE & Leash firsthand, as well as view a large display of other innovative products specially designed for a pet owner's convenience and a dog or cat's happiness in mind. Last year, SitStayGo™ launched the PET DINETTE & Leash; a unique all-in-one system that allows pet owners to conveniently pack all of their walking essentials so that they can grab n' go with ease. When going on a walk with Fido, there are many essentials you will both need to bring along on the journey. Leashes, poop bags, treats, keys, cellphone, and water, are a few important items to have. Carrying these items around on your excursion can be a challenge. The PET DINETTE & Leash changes the way people walk their pets. The PET DINETTE modular serving and storage bowls can be used to serve water, and hold a portion of food or stash of treats. It also has the diameter to hold credit card, license, or spare house key. If water is all you need, just carry one bowl with the flask. Not only is it great for walks or hikes, but road trips and plane trips as well. It's also ideal for a kitty in transit! Spout is easy to refill at sinks and fountains. Retailing for $29.99, the PET DINETTE & Leash includes a strong 5 foot nylon leash and two BPA-free, dishwasher safe, food-grade plastic serving/storage bowls. The bowls hold up to 10oz of water, food and treats; or you can use them as storage and carry what you need. Pet owners can hold the PET DINETTE & Leash comfortably in their hand during walks or hikes thanks to the soft rubber handle. The bowls are strong and sturdy, reinforced with stainless steel, rust-proof screws and a leash anchor. Some additional features of the PET DINETTE & Leash include: the water vessel detaches for cleaning, you can attach your own waste bag dispenser, and it includes reflective tape for night walks. This product is great for cat owners as well. Simply unhook the leash and you have everything you need for a trip with your feline. "My goal is to make the process of travel with pets more turnkey and less stressful for both pet and owner," expresses Creator and Founder of PET DINETTE & Leash, Michelle Glasser, "The grab n' go nature of the PET DINETTE & Leash ensures people have everything they need for their pets when in transit. We are very excited to bring this innovation along with many other beneficial products to this year's Global Pet Expo!" In addition to the PET DINETTE & Leash, the SitStayGo™ booth #6154 will feature a variety of "paw-some" items for both pets and pet lovers. This includes: a diabetic pet cooler and carrier, GPS pet locator device, grooming products, airline compliant carrier, bowls, apparel, bed, toys, car organizers, home décor items, and much more. Michelle and the SitStayGo™ team are devoted to giving back to the animal community. The company donates a portion of each purchase on their website to the Mt. Pleasant Animal Shelter in East Hanover, NJ. Learn more about SitStayGo™ at: https://sitstaygoco.com/.